SayWhatNews: Good morning Katlin. Thanks for speaking with SayWhatNews. First tell us who is Katlin Mastandrea? Katlin: I guess the girl next door that just happens to really love to laugh, a lot. A prerequisite with me, you need a sense of humor and to not take yourself too seriously. SayWhatNews: At the tender age of 2 years old you told your mom you wanted to, “make people laugh”. When did you discover your passion for acting? Katlin: Whenever I watched a movie or anything related to acting really. I was just always “on” I guess and didn't even know it. I have always liked the feeling of making someone laugh. So being able to do that was more my drive than realizing it was actually acting. SayWhatNews: Katlin you were born in Englewood, Colorado. At what age did you decide to take a chance on your acting career and move to LA? Katlin: I was 12, almost 13, when I did my first competition. We then came to LA off and on for a year to get an idea of what we would be really getting into, and how to actually pursue an acting career. I was 16 when we made the move to LA and started “taking my chance” on a career. SayWhatNews: Your journey in Hollywood has been filled with some rejection in the beginning like so many other aspiring actors. What inspires you to continue fighting through those obstacles and not give up? Katlin: My family helps. And, I suppose I’m more stubborn about not giving up on this adventure. I think by defining myself as not only an actor, but also many other things, my writing, illustrating, learning guitar, schooling; help keep me from constantly waiting for “that phone call” as a lot of actors tend to do. I try not to think about all the rejection, rather about what stories I want to tell, or how to stretch myself or morph into something completely different than myself. And I also feel that I will be the one to create a “big break” for myself. I can't wait for someone to hand it to me because that is unrealistic and depressing because it really doesn't happen. I can only give my free show, the audition, and hope they like it and I have another connection out there. Then I hope they remember me next time something comes along. SayWhatNews: Wow, you have such a great outlook on reality and self-made success. It’s very empowering. 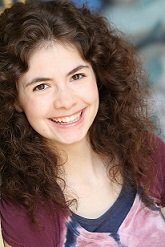 Katlin, you participated in a weeklong workshop with Casting Director Scott David who brought you in to audition for CBS hit show Criminal Minds. How exciting was that moment when you learned Scott David saw something unique in your acting skills? Katlin: Pretty exciting, but also humbling because I had just moved to LA and his was one of the first workshops I had done. I worked really hard to add what he was seeing into what I just normally did. I knew from him then that I was headed in the right direction. His support just made me push even further. Knowing someone who gets you and sees something, changes a lot in the pursuit of the dream, at least it has for me. SayWhatNews: Although the first audition did not end up landing a role, you later auditioned again and were cast in Criminal Minds episode, “Mosley Lane” which was Matthew Gray Gubler’s directorial debut. This was your first big break, tell us about that experience? Katlin: It was rather spectacular. It was fantastic to work with such talented people. I was a bit spoiled for this being my first time on a studio set because it was just so much fun and relaxed. I know, people comment “how can it be relaxed? It's an intense show.” Honestly though, even though we filmed at a crematorium and they were killing off children, it was rather easy to turn off the creepy scared at “cut” because with Matthew, it was just so easy to switch back to goofiness. I was very fortunate to find a life long friend and mentor from this break. SayWhatNews: In 2011 you were honored with the Young Artist Award for your roles in Criminal Minds and Make Believer (Chapman Thesis Short Film). How amazing was it to have your talent recognized? Katlin: Shock mixed with an incredibly fantastic rush of adrenaline just for the moment. I prefer to have one moment of pride and then go back to work with my bar set even higher. Nobody’s perfect and I can always improve. That is what keeps this so interesting. You are the one that gets to stretch and grow if you choose. That's not to say I don't smile a bit when I see the awards later. It's a good start for a career I suppose. SayWhatNews: Katlin, your role as “Weird Ashley” in ABC’s TV series The Middle initially was only for one episode but because of the characters popularity with the audience the role turned into a recurring role for season 3. Tell us about that moment when you learned the news? Katlin: It was a fantastic, frantic moment of pure energy. I was jumping and doing a nice dance. Then I calmed down and thought “oh wow, I wonder where I'll get to go with this character”. SayWhatNews: Your latest role as the character Olivia has landed you on the very much-anticipated show Anger Management alongside the very talented Charlie Sheen as his daughter’s best friend. Tell us about the character? Katlin: She is a bit driven. The club she is in with Sam, Charlie's daughter, is for preparing for college, but she doesn't seem to be focused on the academia of college. Right now, she seems to be more like a pledge in Animal House, or thinks she wants to be. I have a feeling it is all a front to try and cover up feeling like an outsider or brainy or something. We will see where they go with her. I honestly have no idea right now, but it should be a great journey. SayWhatNews: What’s it like working with Charlie Sheen? Katlin: It is actually quite fun. At first I was a little nervous because he is basically an icon and it can set the nerves a bit. From the first table read though, he made it so comfortable, fun, easy going, yet professional. We were there to do a great job. In my first scene with him, I could just see his mind thinking of this and that, and he is such a perfectionist, in a good way, that it was fun to watch unfold. He did compliment me on my hair, which was quite funny. Here we are in the middle of blocking a scene and he catches me off guard for a moment and asks if my hair was real or a wig. Bedhead is always a great thing for me I suppose since it is a conversation piece. He congratulated me on my hair and said it was fantastic. And then, we were back to scene. I love that because my mind works similar in that it switches to something else for a moment, and then, back to what I was doing. He didn't even miss a beat. I know that sounds silly probably, but that will be one of my favorite first memories of working with him...the wheels in Charlie's head. They are, fantastic. He is just so funny. I am just soaking in everything I can from him and the other vets on set. SayWhatNews: That is a great funny moment to remember. Thanks for sharing. Are there any pranks going on during down time on the set of Anger Management? Katlin: I can't say there have been any as yet. Of course, my character is recurring, and we tape so quickly that there really isn't much time to think of pranks. Plus, it was a new set, crew--everyone was getting to know each other and get in the groove. I imagine there were pranks toward the end of the first set of episodes, but I haven't been privy to any if there were. Again, I think everyone was just taking a breath and settling in…maybe if they are picked up for more, there will be opportunities for pranks? SayWhatNews: Anger Management is hilarious and the cast on-screen chemistry amazing. Speaking of more episodes, have you guys heard anything yet about a second season? Katlin: Nothing official that I know of as yet. And the cast chemistry, it is very fun. I think a lot has to do with G and Bruce finding the exact pieces for this puzzle. The set is relaxed and fun because of the great chemistry. I just hope for 90 more episodes. SayWhatNews: As your acting career moves forward, I see you are also enrolled full time at L.A. Valley College to get your directing certificate plus you plan on continuing your education at Chapman University. How do you plan to balance it all? Katlin: Keeping a tab on things immediately due is helpful. I suppose it comes down to time management and priorities. SayWhatNews: I hear you play guitar. Will you ever pursue a music career? Katlin: At this point in time, no. I have my attention toward other ventures at the moment. But that isn't to say I won't continue learning—just have no plans of joining a band in the near future. SayWhatNews: Besides, musical theatre and writing, what other things do like to do in your spare time? Katlin: Does training squirrels for more slightly maniacal purposes count? I do like to unwind by playing video games, even ones where my brother uses me as bait, reading, movies and friends. 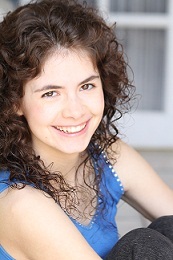 SayWhatNews: What’s next in the future for Katlin Mastandrea? Katlin: Wow, I really don't know. I hope there is much more ahead with TV and film. But for the things I can control, doing everything I can to get more involved in the process of film making so I can one day put some of my work out there. Also, finishing up my book and starting the series. So, pretty much anything to do with moving forward and catching a break here and there. I would also like to do some documentary work as well. Only time will tell I suppose. I just need to keep busy so I don't think about sitting by the phone and waiting for the call.